This article has been reproduced from the original on the OSCE’s website. The implementation of the revised minimum standard rules for the treatment of prisoners (Nelson Mandela Rules), challenges faced by prison administrations and penitentiary staff, as well as good practices in this regard were the focus of a meeting of practitioners in the OSCE region held on 19 and 20 April 2017 in Warsaw. The event was organised by the OSCE Office for Democratic Institutions and Human Rights (ODIHR) and Penal Reform International (PRI). 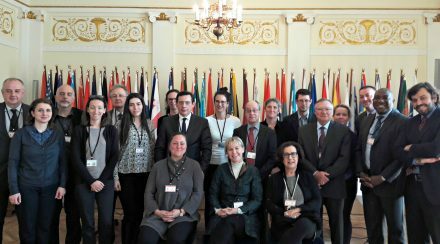 ‘Our aim is to help participating States effectively implement the minimum standards for the treatment of prisoners and to ultimately eradicate torture and other ill-treatment from their penitentiary systems,’ said Stephanie Selg, ODIHR Adviser on Torture Prevention. The UN General Assembly unanimously adopted the revised version of the 60-year-old UN Standard Minimum Rules for the Treatment of Prisoners (SMR) in December 2015, after four years of consultations. The revised standards, underlining in particular the absolute prohibition of torture and other ill-treatment, ‘marked a milestone for the humane and dignified treatment of prisoners in the OSCE region and beyond,’ Selg added. The two-day event brought together over 20 prison administrators and staff, as well as representatives of relevant ministries, mainly from the United States, Canada and Western European countries. The discussion focused on issues related to daily life in prison, such as the use of intrusive body searches, instruments of restraint and solitary confinement, the prison file system, contact with the outside world and the healthcare service in closed facilities. ODIHR, in co-operation with Penal Reform International, will publish guidelines on the implementation of the new provisions of the Nelson Mandela Rules, tailored for prison administrators, penitentiary staff and policymakers, in the second half of 2017.